I came across a weird piece of SQL earlier today where my first reaction was “That is just invalid SQL”, except that I was viewing it in OEM so it clearly had been parsed and executed. Perhaps it is not too bizarre or surprising to some, but because the form of the SQL is something I would not write due to the inherent problem within it that I didn’t expect Oracle to behave as it did. Perhaps that seems innocent enough but its ambiguous and non-resolvable. To demonstrate that let’s consider giving some minor data to A,B and C.
A - records with ID = 1,2 and 3. B - records with ID = 1,2 and 4. C - records with ID = 1 and 2. If A joins to C, we resolve down via the inner join to just IDs of 1 and 2 – and then full outer join to B getting to a final result of 1,2,4. If A joins to B first, we get rows with 1,2,3,4 – and then the inner join to C getting a final result of 1,2. This is why as soon as I saw the statement I considered it invalid – its ambiguous and if I was to treat SQL correctly as a declarative language, there is no notion within that statement as it stands to know which would be the correct answer. So that is so far theory crafting – so let’s put this into some real simple examples of code. So that looks clear, it performs the outer join, and then the inner join – seems straight forward? but if this is properly being treated as declarative as it should be then we still know that there is an ambiguity in the statement, but Oracle has ignored that and applied a rule to make the decision for you. I already have an issue with that approach since there is no indication that it had to step in and correct an ambiguity in the statement submitted. Normally in SQL we know that changing the order of the joins should not make a difference in the result – it can change the explain plan for the query, especially with an ordered hint in place, but the results should be the same – so let’s test that concept on this. Now, in my view of the SQL world, this is just incorrect – the statement was ambiguous to start with and should not of been permitted to be executed, but rejected and an exception thrown. It should be treated as a declarative language and no inference from the order of the joins should be made. Whats surprising to me is that it accepts, parses and executes the statement with no warnings or declaration of what it is doing, and then to make matters worse it is not consistent in the result, but bases the result on an inference which is going to be somewhat random on the style of the developer writing the SQL. I would normally say that the order of joins on a statement does not affect the final output – evidently that is not entirely true. As feature’s go, this one is should be a relatively well-known feature – it’s part of the ANSI SQL-99 standard and available in a number of RDBMs, with near identical implementation on the syntax. Even the esteemed Mr Kyte has changed his position on RCTE’s from being more code and harder to understand than the CONNECT BY syntax, to being a somewhat useful feature. So what was the question to which we could find no answer? Why does a RCTE seem to ignore parallel hints? Amazingly, we can’t find anything documented about this against RCTE’s themselves or in the parallelism sections of the documentation. No mention of restrictions of parallelism on RCTE’s appear anywhere. We have quite a complex example but needed a simple scenario to submit to Oracle to get an answer. Kudos for the krufting of this goes to Phil Miesle – it was his turn to deal with Oracle support. First, create a numbers table, and fill it with data, we even used a RCTE to do that part. Using the numbers table, the table now contains A1 to 1000000 linking to B1 to B100000 – so in effect, every B has 10 A’s linked to it. And finally we have G1 linking to F1 to F10 – so the structure is clearly a very basic tree. Gather the stats to make sure the optimizer is going to have a half chance at a decent plan. So for the test cast query, we wished to generate all the possible paths within the tree – which is in effect a non-cyclical directed graph. This is the ideal scenario for connect by / RCTE to perform its magic, I need to recurse the dataset in a single set based statement. The expected effect on the plan should be that we would see parallelism operations against both table accesses. This now shows us the problem, you can see the PX Co-ordinator is present within the anchor clause of the RCTE, but there is no parallelism listed against the recursion. At first we though it might be ignoring the hints for some reason, but the following idea disproved that theory immediately. The explain plan is of course a terrible plan – there would be no reason to use a merge join, but the fact it appears in the plan demonstrates the hints on the recursion clause are being read by the query engine and that it chose to discard the parallelism ones. Given this example – an SR was raised to find out why the performance is so bad, and are we looking at a bug? If it was a bug, then we could look for a fix of some kind. The test case was accepted and reproduced inside Oracle very efficiently – it was given to the parallel query department to determine what was the problem. This is the expected behavior. Oracle does not parallelize the iterations sub-query of connect-by/recursive-with clause. That’s the last thing we wanted to hear – ‘by design’. It’s by design that this feature is going to be incredibly slow on larger data sets. That’s not so much as ‘design’ as rendering RCTE’s useless in Oracle unless you have small data sets, or don’t mind waiting around for a long time to get answers back. We were already close to ditching any use of the RCTE syntax, this fully nailed the coffin shut on that feature. The plan is no better for using a CONNECT BY – but from a performance perspective the connect by clause is clearly faster when we ran some comparisons. So the verdict on Oracle and RCTE / Recursive Sub-Query Refactoring – excellent language feature – unscalable performance – will refuse to parallel the recursion – very useless for those of us in the VLDB world. A post? yes, it’s been a while and because I am having to spend all my time on Oracle these days – it’s a post relating to a problem in Oracle. 12th character in has increased by one, the rest of the guid remains identical. So ‘most’ platforms will behave like this – that’s helpful documentation, thanks for that. So back to the problem and test case – whenever I come across potential Oracle bugs, I have an immediate suspicion that parallelism is at play – this is just from the consistent experience of Oracle getting parallelism wrong within the database – I have multiple outstanding SR’s for various features when combined with parallelism causing failures – anything from ORA-600’s to incorrect data being returned. (Parallel + Pivot = missing columns, nice!). When you have these GUIDs being generated in a pseudo sequence, it makes sense that adding parallelism is a recipe for disaster, since the parallel slaves would all have to communicate and co-ordinate to ensure that they did not duplicate values in that sequence. After many hours whittling down the original statement, I was able to construct a repeatable test case to finally submit to Oracle for fixing – the shocking part is how trivial it was to demonstrate the problem on a specific AIX environment. This just populates the table with 3 million rows, 30 iterations of 100k rows, it’s a bit faster to do it that way than populate it in a single statement – the connect by level goes slower as the number rises. The easiest way to explain this is from the inside out – the inner most query generates 3 million sys_guid values by selecting from the numbers table and asking for a sys_guid value per row – the statement is given a parallel hint. We then perform an outer select that group’s by the SID (Sys guID) values, and uses a having count(*) > 1 clause to only show duplicates. Under normal conditions this of course should return 0 rows at that point, since every sys_guid generated should be unique. The next outer select count’s up how many instances of duplicates occurred and finally places this into a variable e.
If e is ever greater than 0, we have encountered a duplicate and an error will be raised. When run on an AIX box with SMT enabled, the error does get raised. The number of duplicates changes per run and seems to have no pattern; it can be anything from about ~40k duplicates up to ~250k duplicates. If you take the parallel hint out of the script, it never fails. So it is clearly linked to the simultanesous creation of sys_guid values. As yet, Oracle have not been able to reproduce this themselves which is indicating that this is a platform specific bug, but the client’s DBA’s have been provided the script and have seen it churn out duplicates time and time again, much to their amazement. They really should use a better algorithm, having such a predictable sequentially guid as their default guid for ‘most’ platforms is less than ideal. Another new programmability feature added in the Denali CTP is ‘Sequences’ – a concept very familiar to those of us who already deal with Oracle, but an unusual addition for SQL Server and one that makes me scratch my head thinking – why? We already have the identity column feature available to us within SQL Server but not available within Oracle, thus the need for sequences in Oracle. When using any identity / numeric key / FK mechanism it is important that the actual value for this identity has no actual relation to the data it represents other than an arbitrary number representing the row, if anything it would be a bad design to rely on the identity value be in sequence, or contiguous in any way. In SQL Server it is not guaranteed to be contiguous at all – transaction rollback or a value other than 1 for the increment for example will prevent it. 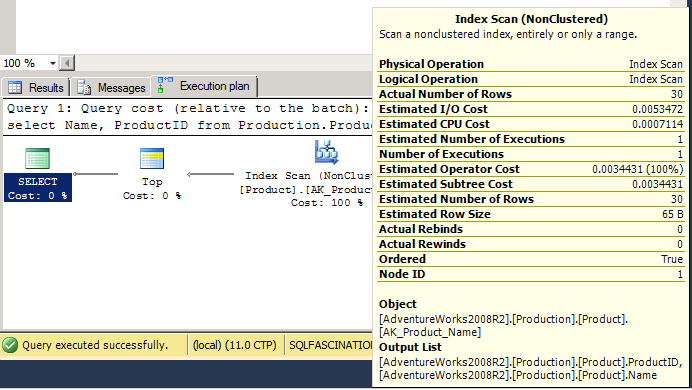 Looking at the syntax you can see that the SQL Server and Oracle Syntax are very similar and share the same keywords. Most of the keywords are self-explanatory, and from a comparison of syntax you can see that SQL Server and Oracle are pretty similar in terms of the syntax. Most of the keywords are pretty self-explanatory, the one that makes me cringe the most is CYCLE – It’s bad enough using a sequence number instead of an identity, but even worse when you consider that it may not be unique. The advice there is to create an additional unique index on the field to prevent an insertion / updated from taking a duplicate – but that seems like a bit of a ‘fudge’, and instead of solving the real problem, works around it. In case you were thinking that was relatively useful, when you re-run the command, you of course are returned a different set of numbers, as the sequence does not restart, making this one of the weirdest features I have seen. If you attempt to place the order on the outside in the following manner, SQL Server will just throw an error. an ORDER BY clause unless the OVER clause is specified. The sequence object 'testSequence' has reached its minimum or maximum value. Restart the sequence object to allow new values to be generated. that is based on one of the above integer data types. and maximum value of the sequence object. Overall sequences remain a bit of a niche feature for me in SQL Server, I just can not see any normal everyday activity needing to use them, although it would make porting of applications between Oracle and SQL Server a bit easier since they will both be able to use them. In that kind of situation though I would still prefer the GUID mechanisms that we have available to us. They have the same benefits of being able to know a record ID in advance of using it as well as the ability to be stored in either database. It also has the added advantage of being able to be created whilst offline from the database, something a sequence can not do. If you have spent any time tinkering about in the transaction log, you will of already come across a bit of a problem when trying to decide what was done and by whom – the ‘what part’ I have decoded in a few posts, but the ‘whom’ part is a lot harder. As far as I can tell the log only contains the SPID of the user who opened the transaction, and does not give us any indication as to who that user really was. From an actual investigative perspective this is a bit of a painful exercise, I can see a row was deleted but to find out who / what did that actual deletion I would have to start examining either the SQL Server logs or the Windows Server Logs. The default behaviour of SQL Server security though is to only log failed login attempts so the successful ones will not show up by default – to get those appearing you need to change your SQL Server security settings. You can access these logs from the SQL management studio using either the xp_readerrorlogs or sp_readerrorlogs procedures although the nature of the log and textural values make it difficult to then combine in a set based manner – I can humanly read the values but machine reading them for any purpose is a bit of a pain – there is also the issue that those logs will be cycled – and the old logs could well be completely offline. The spidArchive table here is created in the master database so that it can cover the connections for any of the databases. You can see we have access to a lot of useful information, not just who executed the command, but from which machine they logged in from. The next step is to get SQL Server to add a row to the table every time a login occurs – from SQL Server 2005 onwards we have had access to DDL triggers as well as DML triggers and have the ability to intercept a number of non-DML events. During the login process, the EventData() function returns a fixed format XML fragment from which we can extract the values we seek and simply insert into our spidArchive table. Now we have a log being taken of all connections being established to the server, we can start using this to translate from a SPID to a user, even when the user is no longer connected – as long as we know the SPID and the time, we just need to look for the closest entry in the past for that SPID, and that will indicate which user was currently logged on at the time. This function should go in the master database again. What you will notice is that for the majority of log lines, there is no user name displayed – this is because the SPID is only recorded against the LOP_BEGIN_XACT entry, the beginning of the transaction. This doesn’t really present a problem, from previous experiments we know all the entries for an individual transaction are given a unique Tansaction ID which we can use to group them together. It becomes pretty trivial to join back to the log, and connect any transaction entries to the LOP_BEGIN_XACT record and produce the name on every row possible. So overall it is not too hard to get the log entries attributed to the accounts that generated them. If your application is using a trusted sub-system approach this of course will not work as a technique, since all the users will be logged into the application through an internal mechanism (such as a users table) and then the application service connects using it’s own credentials – always a good thing since then the user’s have no direct access to the database. In that kind of situation this is of no value, every connection will be shown up as the same user/ source. Within my code I chose to use datetime2(7), to be as accurate as possible on the connections and timings, you could drop to just datetime for SQL Server 2005 but with only 1/300ths of a second accuracy there is a chance on a very busy server that you could see two entries for a single SPID at the same datetime – which would pose a bit of a problem. The spidArchive table can not be allowed to grow unconstrained – I have not included anything here for clearing down the table, but it is not difficult to conceive of it being archived off, or cleaned up weekly via a SQL Agent job. The introduction of paging within SQL Server Denali will have made a significant number of developers happy, all of which will of previously created home-baked solutions to the same problem. All the solutions have the same underlying problem – paging is by its nature is inefficient. Most solutions use the row number analytic function, and then sub-select data from that. For a large dataset that presents a problem – the data has to be fully scanned, sorted and allocated row numbers. A suitable index can eliminate the sort operator, but you still end up scanning the entire index to allocate the row numbers. For my tests, I used the production.product table, and wished to page the products based on their name. There is a non-clustered index on the Name field of the product table as well as a clustered index on the product_id, so what would the query plan give? What I noticed was that the statistics changed to Table ‘Product’. Scan count 1, logical reads 24 – the entire table is contained within 15 pages, so how could it jump to reading 24? A quick check of the query plan showed what has changed, the engine decided that it was cheaper to use the Name index, which for the purposes of the ordering was narrower and therefore more efficient, and then join back to the main table via the clustered key. Understandable, although the additional pages read is unlikely to make this more efficient, but I doubt you would see much real world difference. An oddity, but nothing really significant in it. This triggered a more interesting thought, what happens if we reduce our fields so that the index is considered a covering index? is SQL going to get smart when making a selection – so far we have only seen full table scans occurring. The query is now being covered by the name index since the non-clustered index includes the clustered key (ProductID) – and this changes the query plan again, although its pretty subtle change to notice. The expected index scan appears, but if you look closely at the tooltip for the scan, the number of rows being read in the scan is not the total number of rows in the index, but a product of the offset + the number of rows requested. This was also reflected within the statistics, showing only 2 logical reads – the index uses 6 pages in total. As I changed the number of rows to offset / return the Actual number of rows read changed accordingly. o with a covering index in place, the query engine gets a bit more efficient and does a forward scan of the index until the point at which we have passed a sufficient number of rows. This sounds good – we have avoided scanning the whole index to provide the paged results in a slightly more efficient manner. Except those with a quick mind will realise that the performance degrades as you go further and further down the list, requesting the 490-500th products will results in 500 rows being checked, not 30. By putting in a covering index we have sacrificed consistency on query times to gain some potential performance – the full scans solutions will broadly speaking take the same time regardless of which 10 rows you might be requesting, since it has to scan, sort, allocate numbers and then sub-select. As features go, I like the paging – it removes the need for all the different homegrown solutions that are out there, but the performance of it remains a problem – this is no silver bullet to paging performance problems that people have.